You've found the PERFECT vacation retreat & affordable!! Affordable AMAZING 3 bedroom vacation retreat! You just found the PERFECT place to kick up your feet after a long day on the lake (and at an affordable price)! The backyard of this home is a vacation RETREAT with large sparkling pool, beautifully landscaped backyard & new 45 foot log pole patio which will give you plenty of shade on hot summer days! The kitchen is fully equipped with all your culinary needs. There is full access to the two car boat-deep garage PLUS secure/gated 40' boat parking on the side of the house (which is shaded most of the day). Propane BBQ provided for cook outs by the pool with friends & family. In the evenings grab the popcorn & enjoy movie night on our 60" HDTV and watch FREE Netflix movies. Or have fun playing card or board games (provided). Each bedroom has it's own flat screen TV (with NetFlix). High-speed internet & WiFi included in quote. If you're flying in, provide pool rafts/toys, ice chests, beach towels and beach chairs (to take to the lake). Just bring your suitcase, swimsuit and toothbrush - everything else is provided! This property is fully furnished down to the last detail! Enjoy Arizona's amazing sunsets from the backyard of this lovely property! Only 10 minute drive to London Bridge and tourist area (and 6 mins to downtown). NOTE: The cleaning fee is NOT included in HomeAway's quote since it is paid to our hardworking cleaning crew when you DEPART. The cleaning fee ranges from $99 to $129 based on length of stay & number of guests. Please ask Cyndi for quote. 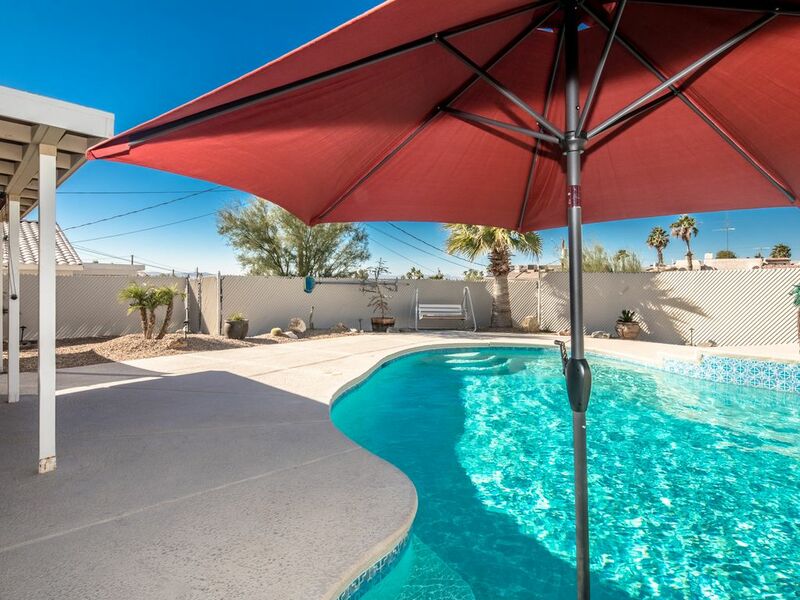 Large sparkling pool, desert/tropical landscaped backyard, VERY clean, affordable, umbrella seating area in pool and on upper deck, 40 foot log pole patio w/ plenty of shade during summer, large area of cool decking (& lounge chairs) around pool. Unlimited FREE movies via Netflix, BluRay DVD, phone (nationwide calling) & high-speed internet (& WiFi) provided. Board games, corn hole boards game (upon request) & pool toys, beach chairs, ice chests (etc) provided. The master bath has a walk-in shower and 2nd bath has tub/shower combo. Lake Havasu is home to the London Bridge tourist attraction. The lake has 33 miles of shoreline and is a terrific place for boating and fishing. Family fun awaits you in Lake Havasu! Lake Havasu has 30 miles of shoreline and is a great place for fishing, water skiing and wildlife viewing. There are plenty of boat & wave runner rentals in the area & activities planned year round. Two car garage & gated boat parking. Everything in garage is for renters use: beach chairs, ice chests, beach umbrella, rafts & toys for pool. Washer & dryer. Stereo, 42" LCD HDTV, DVD player with video collection and Netflix (unlimited FREE movies). This house has a covered patio with table and chairs for outside dining. There are no stairs or steps to get into the house. The driveway is mostly level (normal slant per city code). This property is NOT set up for handicap needs meaning NO handrails in bathrooms and bathrooms are too small for wheelchair mobility. There is a step-in shower in the master bath and the 2nd bathroom has a tub/shower combo. Doorways are normal width. Large pool with table and umbrella in pool. This is a great family vacation spot. The house and pool area are fantastic. Visit the London Bridge (10 minute drive) and rent a boat (or wave runners) to take on the lake (or bring your own!) There are several companies that offer boat tours of the lake or take the $3 boat ride across the lake to the casinos on the water. We offer plenty of info at the house on things to do. Also, lowest price on pontoon rentals in Havasu! This home was so clean and tight. Cyndi was a great host. Clean, comfortable, organized, very nice. Celebrated my 60th with the kids and everything was perfect. We will be back next year.... Thanks Cyndi !! We booked a last minute trip to Lake Havasu for the weekend. The house was immaculate and the back yard is beautiful. By far the nicest cleanest pool and home we have ever stayed at. Cyndi is very hands on and has managed to have every detail worked out in her home. She has very helpful notes and instructions and we found everything very easily. We will def be coming back again. We appreciate all your work and effort you do to keep your home nice. Thank you. Cyndi's home's as always are in immaculate condition and organized. I Definitely recommend her🏠🚤. What a wonderful place!! This house has everything you need!! It was very comfortable. The pool was a great bonus! We were very grateful that it was a pet friendly property. It was close to everything! We booked pretty last minute and Cyndi made everything so easy. She was fantastic to work with! We would definitely recommend this place and are looking forward to our next stay!!! Thank you Kim for your great review! We occasionally will allow a pet (sorry no cat) with careful screening. We understand that the family dog is part of the family, one FULLY housetrained pet may be allowed. We pride ourselves on our homes being sparkling CLEAN as you will notice in our numerous reviews. The large refreshing pool with 45 foot covered patio & beautifully landscaped yard (w/ great view of sunsets) keep our guests coming back every year! The house and property are beautiful! We literally didn’t need to bring anything but our swimsuits!! Cyndi made our stay so memorable! The house was impeccable and had EVERYTHING we needed!! It was the best vacation of our lives!! We will be staying here every year!! There is a cleaning fee which is NOT included in the above quote. Cleaning fee is left for our cleaning crew when you depart. Price varies from $85 to $125 based on length of stay and number of guests using the house. Please request cleaning fee amount when you send your inquiry. The $500 deposit to "hold" your reservation is 50% refundable if canceled 30 days or more prior to your arrival & non-refundable less than 30 days. It will become your "security deposit" once you arrive & is then fully refundable if there is no damage and the house is left in good order. Deposit amount may vary and is based on length of stay and number of guests. Smoking allowed outside only.